I'm not sure how often "Stick a fork in them, the run is over, Wilbon," comes up in normal conversation, but if it does, these Chinese students learning English have that situation covered. As far as I can determine, the videos below were made by Verona, Pennsylvania native Gavin Jenkins, who teaches English at a middle school in Shenzhen, China, where he's been living for about a year. Much of his teaching plan revolves around sports, which is always fun. It's all undoubtedly part of a bigger plan: When our financial overlords eventually come here and put us to work in their sugar mines, they'll have to know how to speak our language. What better source for that than Wilbon and Kornheiser on Pardon the Interruption? 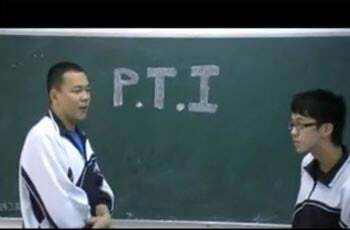 Also entertaining: Chinese PTI with girls. But for more advanced students, there's the class on NHL trash talking. It's the sign of a highly advanced educational system when your midterm final includes the sentence: "Flyers fans have the IQ of sweet potatoes."